Last year Western Digital overhauled their WD Black NVMe SSD with an upgrade to 3D NAND and a new in-house SSD controller, transforming the product line from one of the slowest NVMe drives to one of the top high-end competitors. 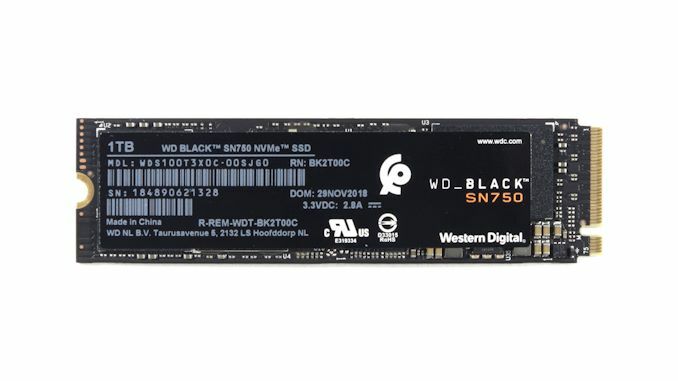 Now the third generation WD Black SSD is here, with the model number SN750 to avoid confusion with its predecessors. (Internally, last year's model was known as the SN700, and the OEM version was the SN720.) The new WD Black SN750 is an incremental update over last year's model, keeping the same basic controller and 64L 3D NAND combination but refining the firmware and adding a 2TB option. Western Digital is also shifting their marketing efforts more toward gamers with the addition of SKUs featuring a large heatsink. The second-generation WD Black launched last year delivered performance that is generally competitive with other top NVMe SSDs like the Samsung 970 EVO, while usually operating with far better power efficiency. 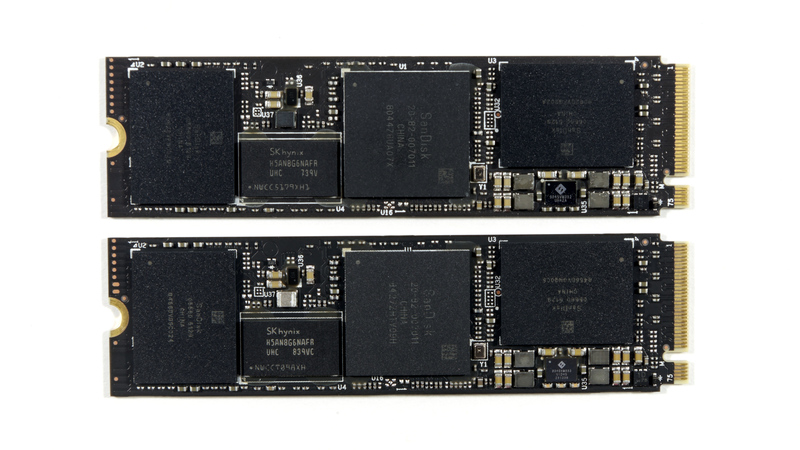 The only other high-end NVMe SSDs that have similar efficiency are the Toshiba XG5 and XG6, but the controller they use puts them clearly in a lower performance class than the WD Black. However, last year's model was still the first release of a new controller architecture, so it is no surprise that Western Digital has some firmware improvements to deliver. It is a bit disappointing that those improvements aren't being distributed as free firmware updates to owners of last year's model, but Western Digital is not the only company that's taken this approach. Aside from the addition of the 2TB option, the most noticeable changes to the specs table are the vastly lower MSRPs: the 2TB will debut for only $50 more than the 1TB model was at introduction last year, and the smallest price drop is the 33% cut to the 250GB model's price tag. Performance has been improved slightly across most of the major metrics, but none of the improvements are anything huge. The 2TB model will actually be slightly slower than the 1TB, due in part to using 512Gb NAND dies instead of 256Gb dies so that the 2TB model can still be a single-sided M.2 card. The 2TB model and the SKUs equipped with heatsinks will be arriving this spring, but the plain 250GB through 1TB models ship this month. Western Digital has not provided MSRPs for the models with heatsinks, but we expect them to carry a bit of a premium when they arrive. Peeking under the label, we find essentially the same PCB as last year's model, though it appears we've gone from revision A to revision D. The WD Black SN750 is equipped with the same controller and NAND parts as last year's WD Black and SanDisk Extreme Pro, and the only differences in chip markings appear to be date codes or lot numbers. 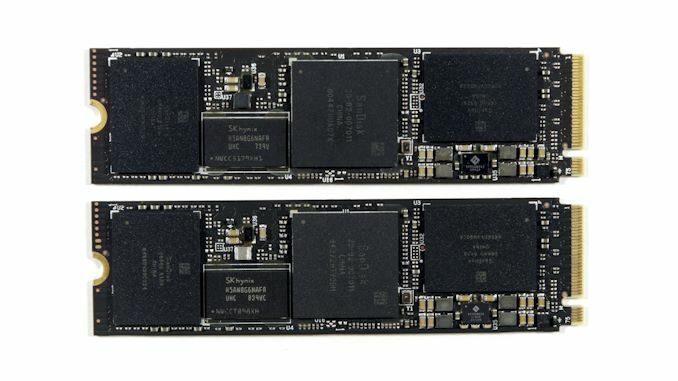 Unlike last year's model, the new WD Black SN750 does not have a sibling product under the SanDisk brand; the SanDisk Extreme Pro NVMe SSD is now strictly speaking an outdated product, though it is still very similar to the new WD Black. Western Digital has made a few superficial changes to the WD Black to make it more gamer-oriented. The product packaging and labeling has been restyled, and all but the smallest model will soon be available in versions with a custom aluminum heatsink from EKWB. Additionally, there's a new version of Western Digital's new SSD Dashboard software for Windows that adds a "Gaming Mode" which re-configures the NVMe driver to not enable Autonomous Power State Transitions. When this gaming mode is enabled, the drive won't make use of its low-power idle states, which avoids the extra latency of waking the drive up after it has been idle for a few seconds. However, in our experience few gaming desktops are configured to use the deepest idle states, and the WD Black wakes up very quickly from its intermediate idle, so this feature will be inconsequential for most users. Our Linux-based synthetic performance tests are already conducted with APST off so that idle wake-up latency doesn't distort those results. Our Windows-based ATSB trace tests leave APST enabled, but the trace playback cuts idle times short enough that most NVMe drives won't be entering low-power states during those tests, either. 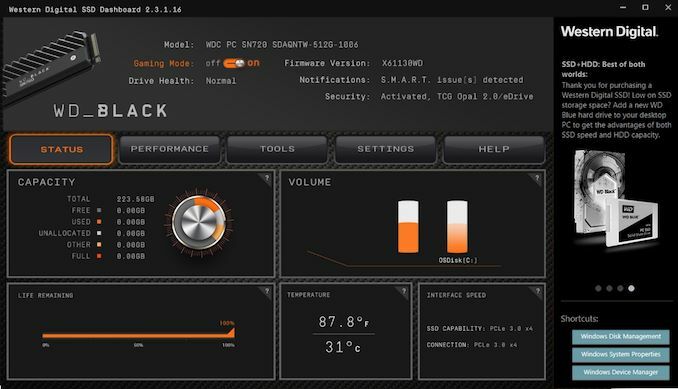 The SYSmark 2018 test gives SSDs plenty of idle time to make use of their deepest idle states, but overall the workload it presents is not storage-intensive enough for WD's Gaming Mode to have a noticeable effect. It may seem odd that Western Digital is sticking with their 64-layer 3D NAND even months after their partner Toshiba started shipping 96L 3D NAND with the XG6, but the transition to 96L NAND will look very different from the transition to 64L NAND. The 64L generation leveled the playing field as Toshiba and Western Digital delivered their first 3D NAND worth mass producing, and Intel and Micron made significant performance improvements over their previous 32L NAND. As most of the major manufacturers largely caught up to Samsung and ramped up production, prices crashed. That's been great news for consumers, but has prompted the manufacturers to slow their investments into 96L production to avoid worsening the oversupply. Thus, we expect the 96L transition to proceed more slowly, taking all of 2019 and probably into 2020 before every 64L product line gets upgraded. The 96L upgrade has the potential to bring some significant performance and power improvements, but will in most cases require a new generation of controllers that can take advantage of higher controller-to-NAND interface speeds or lower operating voltages. Since last year's WD Black launched, the most important new competitors to hit the scene have been drives based on Intel/Micron NAND with the SM2262 controller, and drives using the same Toshiba/SanDisk NAND with the Phison E12 controller. The SM2262 drives (represented in this review by the HP EX920) are now being phased out in favor of the upgraded SM2262EN controller, which we previewed last year. Representing the Phison E12 family, we have the Corsair Force MP510 960GB.